White Christmas tree decoration ideas are shared in this post, as I join in with several friends. 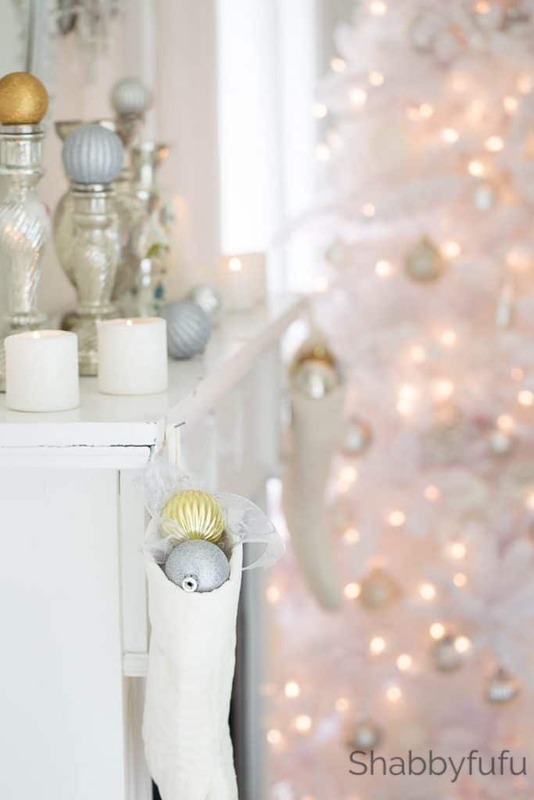 The magic of Christmas conjures up all sorts of memories of winters that have long since passed. Thoughts of snow and glistening trees with city lights creating that perfect white Christmas that for me is a distant memory. It’s been years since this Florida girl has seen snow, decades in fact. As an artist and a dreamer I create my own snowy fantasy land in at least one corner or one room every Christmas. I like to think of it in the same realm that a painter may work on a canvas, yet in true three dimensional form. Looking at my own snowy Christmas corner calls to mind the times that we took winter vacations with the kids to see snow in the high country of North Carolina. 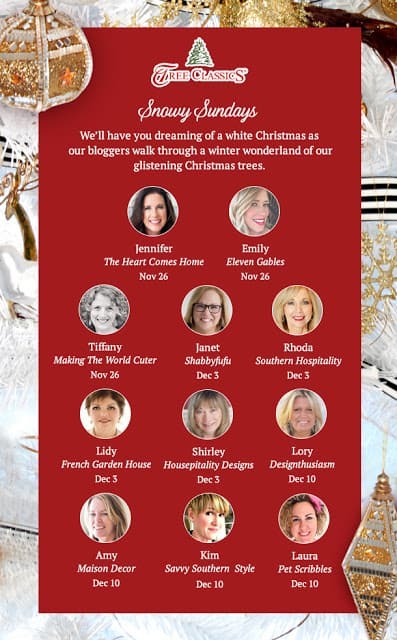 Sweet cabin stays with logs popping and crinkling on the fire and reflections of the iced over pond in the window are all recreated in my mind by a SNOWY CHRISTMAS theme. In the master bedroom I generally go with a Snowy White Christmas and you can see a couple of my posts from previous years HERE and HERE. Our old white Christmas tree that was given to me by a client some years back was finally ready to be tossed. 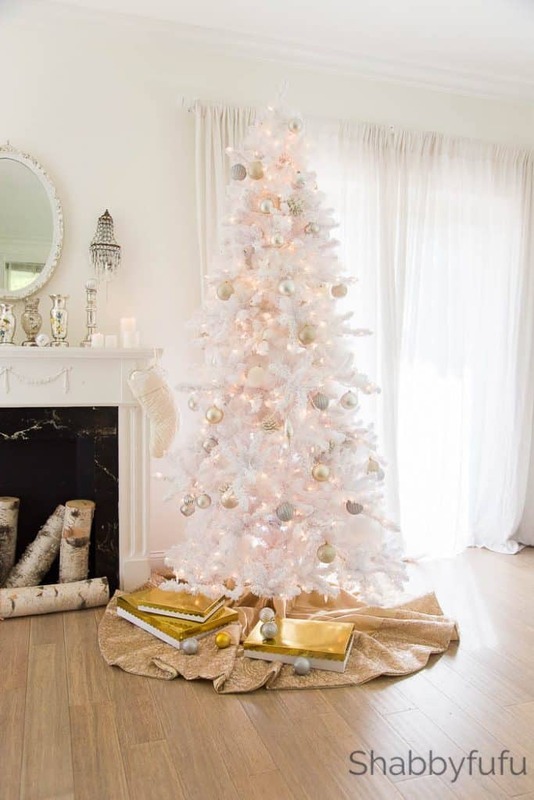 I’m partnering once again with Tree Classics on this post and received the 7 1/2 Flocked White Deluxe Tree (pre-lit) that’s perfect for a standard ceiling height room like our master bedroom. 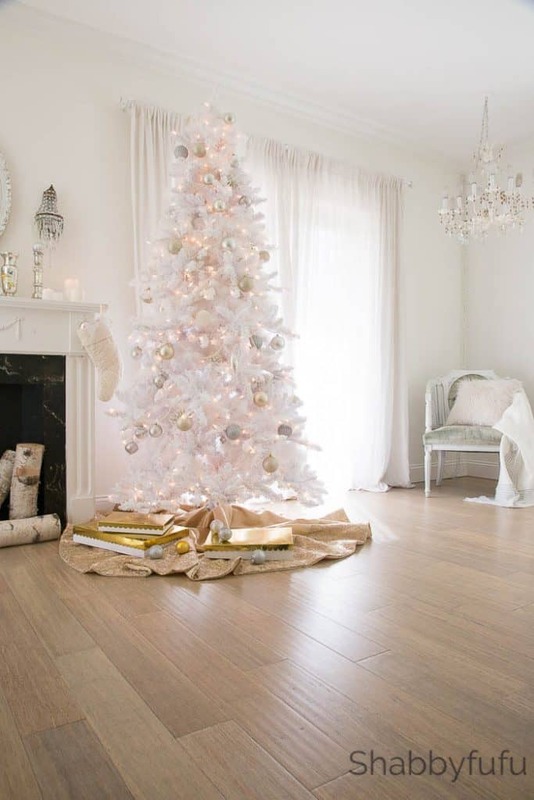 I know the quality is there with a TREE CLASSICS tree, as I received a tree from them last year that I just love. 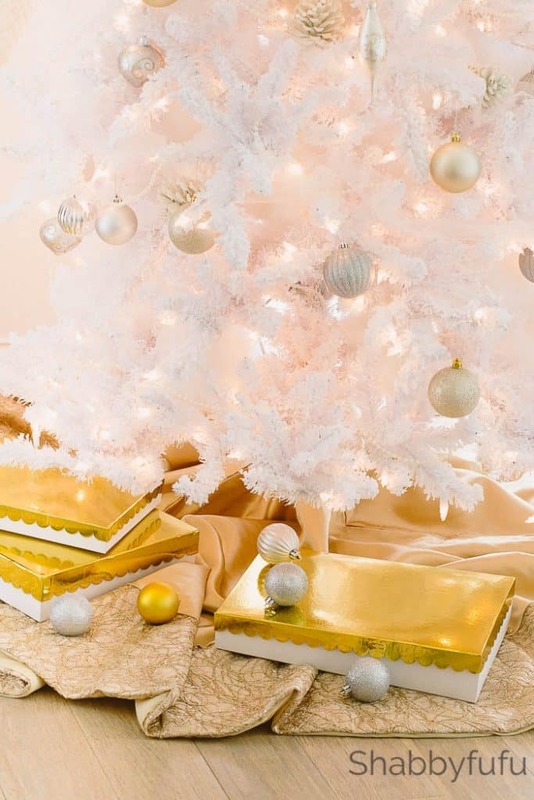 By using the coolness of winter white and combining it with gold, the feeling is cozy and warm. The tree is full and it’s flocked, but I wanted to add to that fullness and talked about how I added some SNOW to it and love how extra, extra full it now appears. 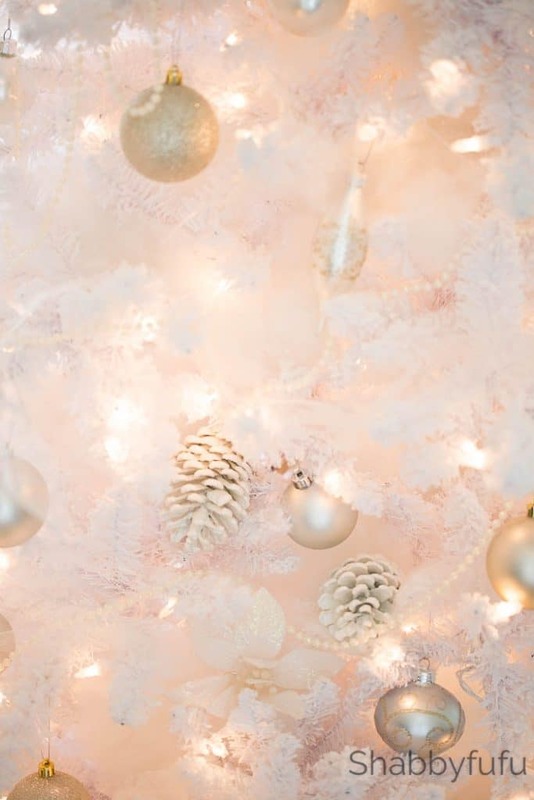 Other white Christmas tree decoration ideas that you can add are white painted pine cones, tulle, white poinsettia picks and pearl garland. 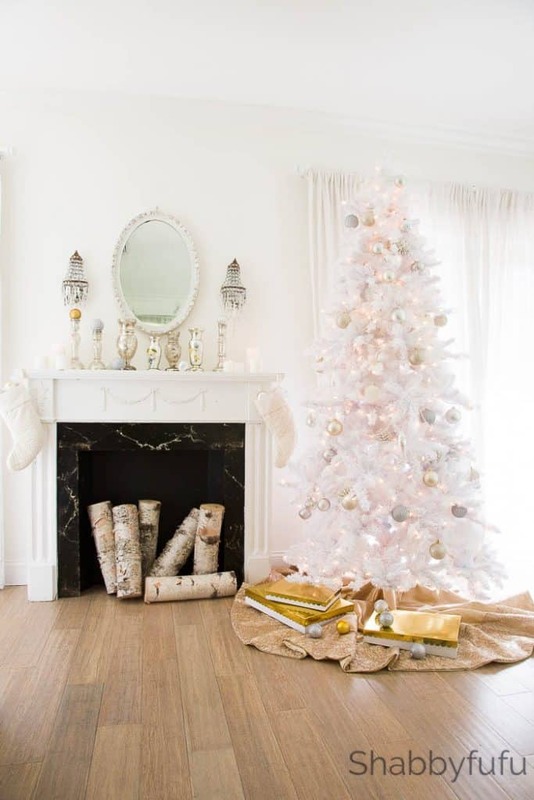 I love a nice full tree, but back up and take a look…because oftentimes less is more. Day or night there is always such a soft snowy glow with a white flocked Christmas tree that I love to look at. 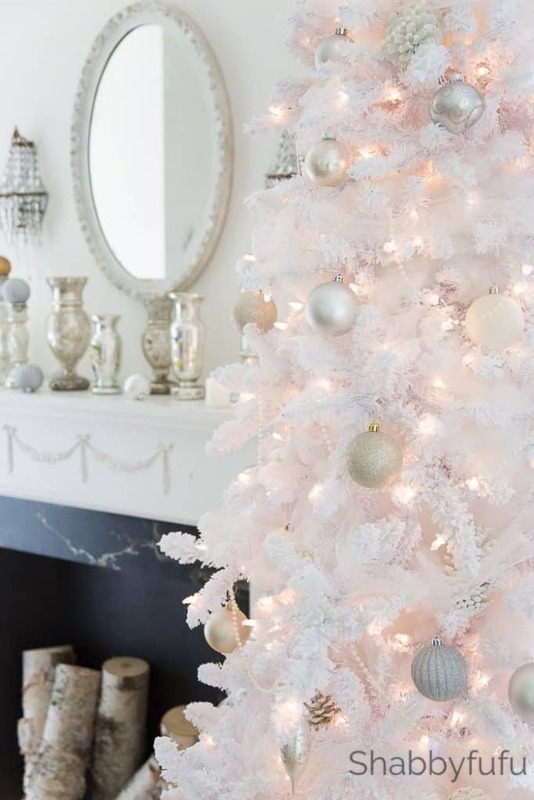 I may not have snow here in Florida where our home is but the look of snow is recreated in our bedroom that has a framework of white enhanced by this tree. 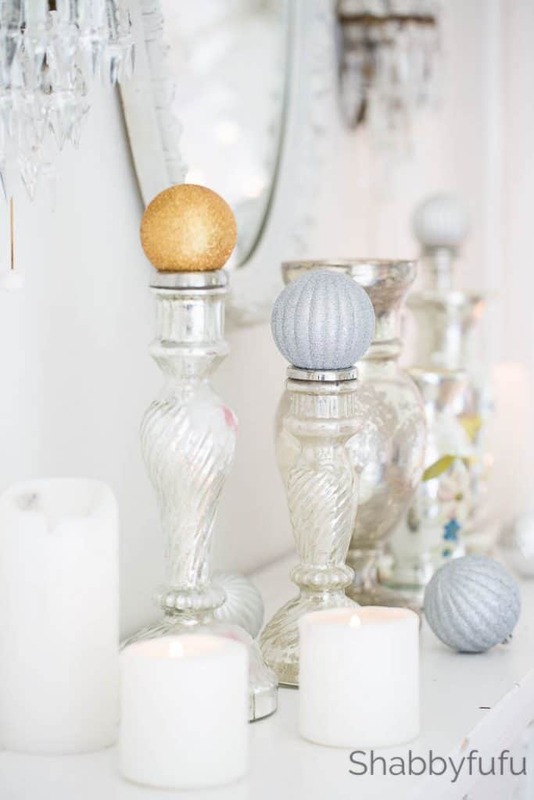 Some mercury glass and candles on the mantel and my winter wonderland is pretty much set.